The predominant moral issue of the 21st century ... will be climate change. ​Fossil fuel addiction, if unabated, threatens our children and grandchildren, and most species on the planet. Already in 2009 an estimated 300,000 people a year were being killed by climate change, according to research the the Global Humanitarian Forum's Human Impact Report. In the 2012 the humanitarian organization DARA's Climate Vulnerability Monitor estimated 400,00 are killed by global climate change every years, in a study ​​​independent of the Human Impact Report. This condemns billions of people to devastating losses of water, food, and health. UNEP in its 2009 4th Global Environmental Outlook made worldwide headlines, saying global climate change impacting on top of other ongoing unmitigated global environmental degradations threatens the very ​​survival of humanity . The Dec 2015 well intended UN Paris Agreement turns out to be a global death sentence as only a handful of countries have emission targets that may meet the Agreement's aim. Climate Action Tracker rates countries by their national emissions targets in terms of 1.5° C and 2° C compliant by 2100. Only Morroco and the Gambia have national emissions targets consistent with a 1.5° C limit by 2100, while only Bhutan, Costa Rica Ethiopia, India and the Philippines have emissions targets consistent with 2° C by 2100. 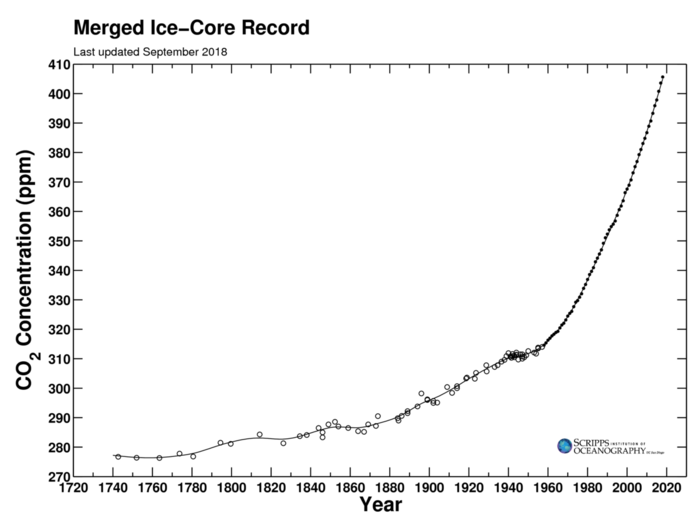 2C at 2100 increases slowly to 3.5C long after 2100. The 2016 Republican platform explained in the Grist report continues US Republican Party's opposition to prevent total climate and oceans catastrophe from continued fossil fuel greenhouse gas emissions. The 2016 US ​Republican election sweep and Trump elected for president. ​The biggest and worst news for the global climate and oceans is the 2016 Republican sweep of the US election, with the win by D. Trump. The USA has a climate government. Australia has also. It is much more than a political shock. It is an Earth shattering event, because of the Trump ​election platform on energy and his profit above planet ideology, on which he has moved swiftly as President. ​​​​The US Republican Party for years has been the political arm of the dangerous climate change denial campaign. Here, is what D. Trump promised to do regarding energy in his election campaign. ​Unleash America’s $50 trillion in untapped shale, oil, and natural gas reserves, plus hundreds of years in clean coal reserves. Open onshore and offshore leasing on federal lands, eliminate moratorium on coal leasing, and open shale energy deposits. ​The first UN Conference of the Parties (COP) was 1995 hosted by Berlin. Ever since a large number large fossil fuel producing and using countries have managed to sabotage any progress by delaying strategies. The ad hoc in effect unanimous UN consensus allows countries to veto proposals for real progress. ​​ The international climate negotiations under the United ​Nations 1992 Framework Convention on Climate Change continue to make no substantial progress due to continued obstruction by large ​industrial fossil fuel using and the fossil fuel producing countries. ​In various ways practically all governments are denying the science ​of global climate change by continuing with energy policies that are ​driving the acceleration of atmospheric carbon dioxide and ocean ​acidification, failing to enact atmospheric greenhouse (GHG) regulations, and susidizing fossil fuels. The worst example is the continuing increased fossil fuel subsidies​. 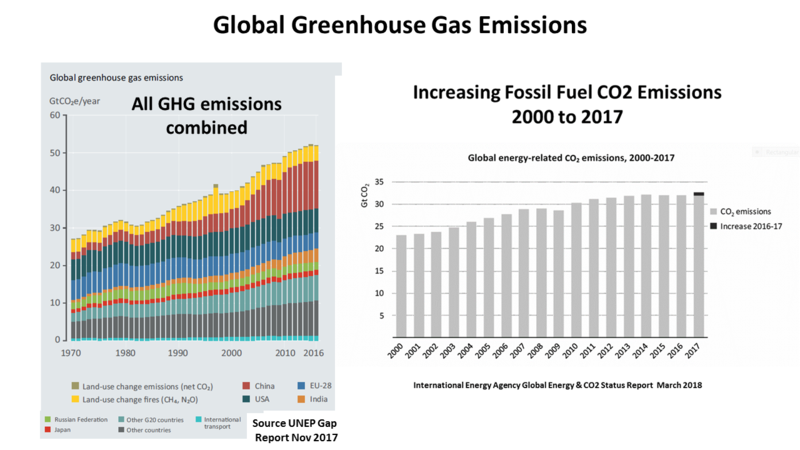 In 2017 global fossil fuel emissions ​increased to a new record high. Some progress is being made recognizing the terrible crime, but our constitutions laws and institutions could never have foreseen such a situation. The 2015 Encyclical of Pope Francis on the environment and human ecology received wide well deserved attention, and he since has declared changing the climate a sin against God. ​Thanks Largely to US research by Mary Wood (Nature's Trust), atmospheric litigation under the public trust doctrine is being heard by courts, in the US by action brought by Our Children's Trust. Already committed and continued greenhouse gas pollution driven climate and oceans disruption are unprecedented crimes against huge most vulnerable ​​human populations. There are reasons why this could called climate economic genocide. It is Ecocide. The 6th mass extinction (accelerating) is a most terrible crime linked to global climate disruption, by each making the other worse. Climate change is just starting to boost the rate of this accelerating mass extinction. Greenhouse gas oceans disruption will increase loss of marine life. A​​ccording to the IPCC 2018 1.5C report the world's coral reefs are practically doomed. Extinction of course is forever​. ​It is a documented fact that all world governments are fully aware of the climate change science and the current state of the climate. This is because through the roof of process of the intergovernmental panel on climate change IP CC all world governments acknowledge and improve of the line by line scrutiny by government policymakers who sit on the panel. The short IPCC Summaries for Policy Makers are written to be understandable by any policy maker and the even shorter Headline Statements to be understood by anyone (educated). The downside of this everyone has to agree consensus is that it gives fossil fuel supporting governments the power to water down and exclude science published in the IPCC assessments. A crucial ​ aspect of the science (documented since the 1st 1990 IPCC assessment) and the crime is that global warming today is much lower than the future 'committed' or locked in warming is, due to several lag times from global policy action to put global emissions into a rapid decline up to the time when global warming stops completely or stabilizes. All of these lags that increase future warming are caused by the atmospheric GHG concentrations at the time. Today's degree of climate change WILL increase substantially and then last for a thousand years. As S Solomon explained (Irreversible climate change due to carbon dioxide emissions, 2009) we can predict future disastrous ​changes to the planet and impacts to populations that will be permanent. These are, (1) the time for policy to effect a rapid reduction in global emissions, (2) the time taken by the vast oceans to take up and distribute GHG heat energy to the planet surface, (3) unmasking of fossil fuel air pollution cooling aerosols (when all fossil fuel energy use stops), all on top of the very long lifetime of atmospheric CO2 emissions in the atmosphere (1oos of years). These have been explained in IPCC assessments from the 1990 assessment, so are well known. Extra warming will be added by (4) amplifying feedback emissions as the warming Earth surface becomes a net carbon emitter. The obvious example is more forest fires with surface warming. This was a reason for the 2C limit, but now is an imperative for 1.5C, because planet carbon sinks are switching to carbon sources that if which includes the Arctic. Policy therefore has to be based on preventing/mitigating committed climate change, which today is 1.5C 2100 and over 2C long after 2100 to temperature equilibrium. ​Climate justice and awareness would be helped considerably if the global climate /planet emergency of today's climate change and committed future climate change was acknowledged, but it still is not. The reason given is that it would not motivate people! ​Atmospheric greenhouse emissions global climate and ocean disruption are 'for ever' because CO2 emissions last in the atmosphere practically forever. 20% of a CO2 emission is still in the atmosphere after 1000 years. A small proportion of methane (CH4) emissions are converted to CO2 in the atmosphere. The other main greenhouse gas nitrous oxide (N2O) lasts 120 years. Because of climate change commitment always being much higher than the realized warming, when an impact occurs it is irreversible and will get worse. ​It is a long-time well-known fact that tens of millions of the most vulnerable by socio-economic deprived inhabit regions that are most climate change vulnerable, and they are the most climate change innocent. 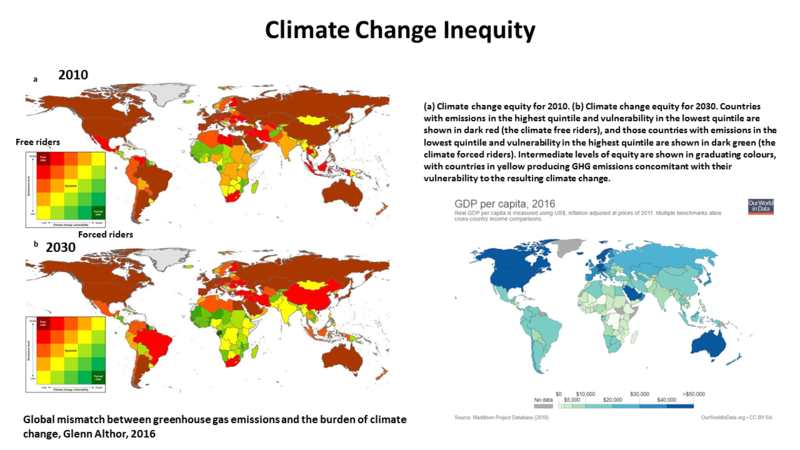 (maps) Climate change is projected to be a poverty multiplier, which means that its impacts make the poor poorer and increase the total number of people living in poverty (IPCC 2018 1.5C . 3-177). Climate change (to 2C) could force.. people into extreme poverty, with the numbers attributed to climate change alone between 3 million and 16 million, mostly through impacts on agriculture and food prices (IPCC 2015 1.5C 3-112). ​​Even though "limiting global warming to 1.5°C, compared with 2°C, could reduce the number of people both exposed to climate-related risks and susceptible to poverty by up to several hundred million by 2050" (IPCC 2018 1.5C, SPM B51), the national emissions targets condemn the world to 3.2C, presumably on the basis of IPCCs false fossil fuel biased costs. ​Called false solutions by some, for many years the industrially developed wealthy countries have used methods of pretense on reducing their emissions. Carbon trading, carbon off-setting assumed carbon capture sequestration (CCS) from the fossil fuel industries and assumed Bio-energy CCS to even remove CO2 emissions (CCS) and bioenergy(BECCS), REDD, are ways countries have avoided replacing fossil fuel energy with clean renewable energy. ​Climate change is already causing food insecurity that is leading to bloody conflicts. In a rapidly climate disrupted world refugees will not be welcome and today's food aid will not be forthcoming. These climate refugees will die if not killed. ​Out-migration in agricultural-dependent communities is positively and statistically significantly associated with global temperature (IPCC 2018 1.5C 3-11). Climate refugees do not have the small benefit of refugee status, like refugees from war. A 2018 World Bank report predicts ​climate change will push tens of millions of people to migrate within their countries by 2050. It is now also a crime against all today's children who are the most vulnerable to all impacts of global climate change,and to all future generations. ​up to a ​ billion of those vulnerable at 1.5C. 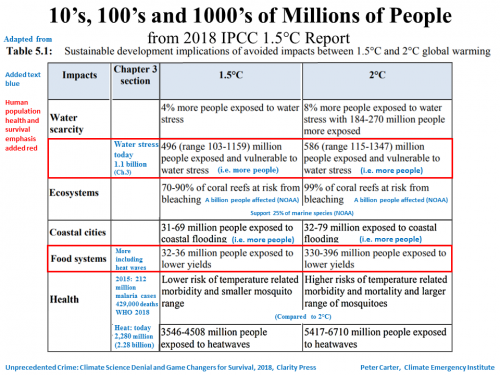 All the IPCC assessments have consistently said (from the 1990 1st assessment to the 2018 1.5C Report IPCC 1.5C 2018 that huge populations in most vulnerable regions would suffer crop declines and also they have all said (incl. 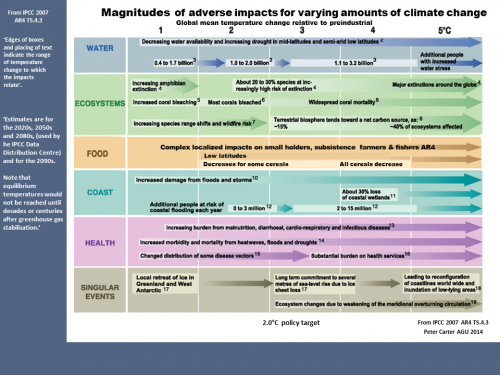 IPCC 1.5C 2018)​​ that temperate region countries could benefit by increasing crop yields under global climate change up to 2100, but this is based on models that cannot capture the large number of large adverse impacts and therefore under estimate. More recent research shows that these temperate regions are vulnerable to crop yield declines by 2050, which is also shown by a close examination of the IPCC models. The world must act fast to prevent outbreaks of climate change driven genocides as insecurity of food and water in the most climate change vulnerable regions increases driving conflict, and there is evidence that the climate change​ complacency of the Global North results from what is in a fact an economic genocidal attitude to the vulnerable Global South. US and other leaders and some experts believe that global climate change is a zero sum​​ game of winners and losers. Already it is not- we are all losing. In fact the Global North may be more vulnerable to extreme weather crop yield shocks. Nevertheless Far North policy makers rely on the IPCC assessments and so can only believe they will win and Global South lose. Certainly this could apply to world governments that by their statements and actions deny the reality of dangerous global climate change and act to oppose ​​progress in replacing fossil fuel energy with clean renewable energy, and act to produce and trade as much fossil fuels as possible. It is a fact that Global North countries persist in refusing to live-up their specific and well-defined socio-economic and technological obligations to the most climate change vulnerable populations in regions (that are specifically listed) in the 1992 UN Framework Convention on Climate Change. Also, none of the industrially developed countries have national emissions targets filed with the United Nations consistent with a 1.5° C global warming limit or 2°C, and this only by 2100. This condemns the world to a 3.2 °C global warming by 2100 (Climate Action Tracker 2018), which is over 5.5°C long after 2100. Already committed sea level rise will drown all low lying islands in the world , and that will destroy the long standing culture of the island populations. The IPCC 2014 assessment and 2018 1.5° C repair report says that short falls in food production affecting the most vulnerable regions could be made up by these countries purchasing food from temperate regions, ignoring the fact that the same reports say that the GDP's of these vulnerable countries will drop under climate change. Marshall Islands foreign minister Tony de Brum has compared the prospect of forced migration of atoll nations to genocide. Jürgen Zimmerer Professor of History at the University of Hamburg, Germany, and President of the International Network of Genocide Scholars published Climate Change and Genocide: Environmental Violence in the 21st Century, 2015. climate change will greatly increase the risk (if not inevitably cause) genocide as regional food insecurity increases. ​​Genocides tend to be linked with increasing food insecurity. The Nazi holocaust was an economic strategy and had origins in post WW1 German food insecurity, explained in 2015 by ​Timothy Snyder professor of history at Yale University- The Next Genocide. ​People are recognizing the climate change genocide. 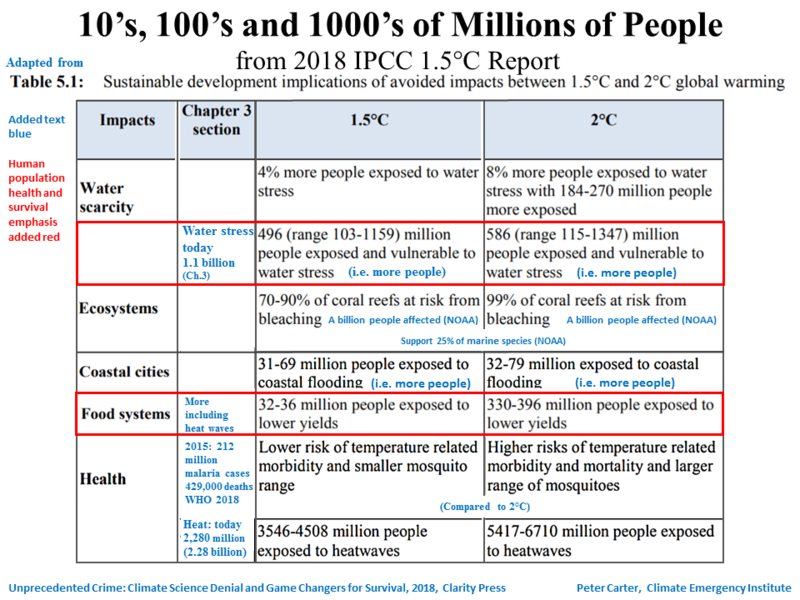 Tens of millions at risk The 2018 IPCC 1.5C Report shows that the lives of tens of millions are at risk (see chart above). Formally the world is at peace because there are no wars declared between nations. However carbon pollution of the atmosphere is a result of the rapid expansion of the military-industrial-financial complex born out of two world wars. The economy of powerful nations remains to a large degree a ​war based economy and human rights ignoring economies and governments in the name of national security. ​Terror rules our world carried out by states and against states. War is legalized mass murder and the war on terror a terrible oxymoron. 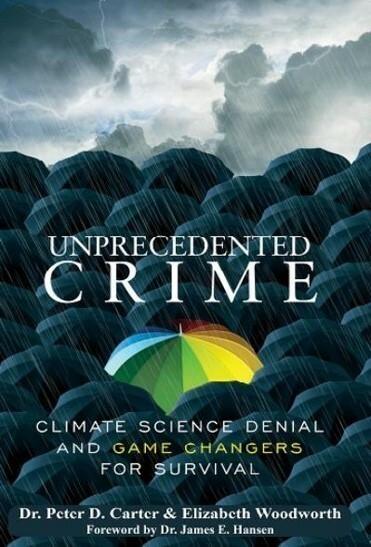 The crime of all time is what I call global climate change (particularly as today's already 'committed' unavoidable increased global climate change). The crime is due to fossil fuel air and atmospheric pollution. It is incomparably worse than any other crime (millions of lives)​. Between 2030 and 2050 (now unavoidable), climate change is expected to cause approximately 250 000 additional deaths per year (WHO 2018) . As fossil fuel ambient air pollution it causes about 3 million deaths a year (WHO 2014). It is global- no region will be spared. It is totally preventable. It is committed for financial profit by large corporations. Governments subsidize it (US$Trillions/year). Climate change deaths will never stop and will keep increasing for many decades. The only plan is for emissions to increase- intentionally by at least 16% to 2030. It is also a crime against (all) Humanity and Nature (the divinity of creation, or sacred Earth). Excessively high summer temperatures, ground level ozone and frequent extreme weather can exceed the tolerance of crops and collapse world agriculture. ​​Due to multiple large sources of planetary amplifying feed-backs (global surface warming causes more global warming) climate heating and disruption could be the end of civilization, the human race and most life. This has been recognized by the UN Sec General António Guterres (2018 UN statements). The essence of the crime of all time is the ignored dire Earth emergency - climate and oceans. ​Atmospheric CO2 and global warming are accelerating. This extract is from IPCC 2007 4th Assessment Ch. 5 p. 299 is greatly distressing and it seems the same attitude prevails today, as it is thje IPCC 2018 1.5C Report. ​​"While moderate warming benefits crop and pasture yields in mid- to high-latitude regions, even slight warming decreases yields in seasonally dry and low-latitude regions​​"
developing countries on food imports"
indicate that, with or without climate change, Millennium Development Goals (MDGs) of halving the proportion of people at risk of hunger by 2015 may not be realised until 2020-2030." No matter what the formal law may say, ethically (and religiously) global climate and oceans' disruption by greenhouse emissions is the worst crime and greatest evil ever, which all people can and should attest to.